Those who wear contact lenses are often faced with the high cost of replacing those lenses when they tear or when the prescription becomes outdated. While some insurance plans may cover contact lenses, the patient must pay a significant amount as a co-pay, which can cause her to wait to order. Just Lenses works to ensure that its customers can place orders, knowing that what they need will be available at an affordable price. In addition to selling gas permeable contact lenses, the website stocks and sells disposable lenses, to include monthly, daily, 1-2 week disposable and color disposable. Patients who have unique eye needs can approach Just Lenses, knowing that their eye care needs will be taken care of. This includes patients who suffer from astigmatism or who may need bifocal lenses. The Just Lenses website has committed itself to providing the best, most affordable and healthy services to its customers. When a customer places an order, she can do so, knowing that what she receives in her shipment will be exactly what the eye doctor has prescribed. Each set of lenses arrives in factory-sealed packaging, immersed in contact lens soaking solution. In addition to all of this, the customer can choose to have her order delivered to the home or office, whichever is the most convenient. Just Lenses knows that its customers have been diagnosed with a condition that affects how they see. For this reason, the website advises that its customers undergo regular eye examinations and follow the instructions of their eye doctors regarding how they wear, care for and dispose of their contact lenses. Just Lenses strongly advises its customers to see their eye doctors if they are experiencing any eye redness, vision change, eye discomfort or unusual watering. The site also tells its customers to remove their contact lenses and wear their eyeglasses until they are able to see their eye doctor. Just Lenses carries gas-permeable contact lenses, disposable, novelty and toric contact lenses. Of the disposable lenses, customers can order bifocals, one and two week disposables, daily and color disposables and monthly disposables. For customers who cannot wear soft or disposable lenses, the gas-permeable lenses are also in stock. The brands carried on the Just Lenses website are Bausch & Lomb, CooperVision, CIBA Vision, Ocular Sciences, Johnson & Johnson and Wesley Jessen. Customers who order soft lenses usually only need vision correction. Some contact lens customers experience less discomfort when they wear soft lenses as opposed to hard or gas-permeable lenses. Customers who suffer from astigmatism need to order the toric lenses. The Just Lenses website makes it easy for contact lens wearers to order contact lens refills and pay for those refills. 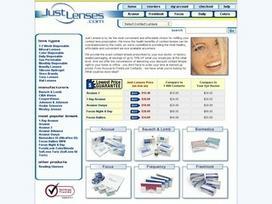 Just Lenses has been online since 1998, providing its customers a way of ordering their lens refills. In addition to gas-permeable, soft and disposable contact lenses, Just Lenses stocks and sells reading glasses to customers who find that their vision is not what it used to be. Share what you think about Just Lenses, and your favorite ways to save there!